The Olympus E-620 is a 12.3 megapixel DSLR that fits in Olympus’ lineup as the little brother to the Olympus E-30. The E-620 includes Art Filters settings, which were made popular and have received much praise on the Olympus E-30. The E-620 is priced at $699 for body only and $799 as a kit with the ED 14-42mm f3.5-5.6 Zuiko Digital Zoom Lens. All in all, I’ll admit that I found this to be an admirable system, with enough functionality to suit even the needs of the advanced amateur, while giving photo enthusiasts a camera they can use immediately sink their teeth into. Inevitably some features have filtered down from the E-30, which is a good thing but that camera is significantly larger and heavier and a good deal more expensive. It doesn’t offer the video recording capabilities of some of its contemporaries, but as a dedicated stills camera, it’s a pretty compelling package. Anything you could possibly dream of; this camera has a function for it. And if we really go for the differences in quality, we find nearly the same quality on the E-620 as that of the more expensive E-30 and E-3. The Olympus E-620 offers the most effective combination of features, ease-of-use and price of any Olympus DSLR camera to date, and it’s also a real contender for the Best Mid-Range DSLR crown. Even in an industry where we’re used to derivative models and trickle-down technology, the E-620 impressed with just how closely its performance – from shooting speed to image quality – aligned with what we saw from the much more expensive parent model. But the E-620’s main appeal may be its size. If you’re a backpacker, or just want a small DSLR, it’s incredibly convenient to tote-and to use. Image quality of the Olympus E620 was generally good – the camera took nicely exposed photos with good color accuracy, sharpness and images were clean at ISO 800 and below. The handling was something we liked about the E-420 and E-520 and the newcomer does nothing to spoil this. It also retains what is probably the most convincing build-quality in its class, thanks to an excellent choice of materials – it feels rugged and well-made. Overall, the Olympus E-620 is the best of the company’s consumer SLRs, offering a feature-set that is superior to the E-420 and E-520. The body still felt a bit too small in our hands, but on the flip side this is one of the most portable SLRs on the market, the pivoting LCD is a lovely piece of gear, and dual memory card slots, even if one is for an xD card, is another welcome feature. The new camera’s 100 percent accurate 270 degree swivel 2.7-inch Live View HyperCrystal III LCD can be rotated freely so photographers can compose at any angle, including overhead and down low, without getting bent out of shape. This enables an E-620 photographer to compose a subject in the Live View LCD and see the results of the various creative features – live as they’re happening. The 2.7-inch LCD makes icons and text on the camera’s menu easy to view. Beyond the camera’s bright viewable LCD, the E-620 is equipped with illuminated buttons on its body that are easily viewable in low light to quickly find the settings you want. Fast Imager Autofocus in Live View:When it comes to measuring camera speed, autofocus is a key factor. If a camera’s AF system does not meet photographers’ demands and lock focus accurately and quickly, it’s possible to miss a shot. AF Live View on the E-620 allows you to compose, focus, and capture the shot quickly and easily without ever taking your eye off the large 2.7-inch full color LCD. Phase Detection AF: When using the optical viewfinder, the technology behind the new 7-point twin cross AF system provides world-class fast and accurate focusing based on the speed of the E-3. Super sensitive Twin and Twin Cross AF target points can measure focus both vertically and horizontally, so regardless of the subject, focusing is super-simple and fast. With a dedicated Phase Detection AF sensor in the camera body, shooting moving subjects, like a runner crossing the finish line, is lightning fast. In low-light situations, this is the AF option of choice to quickly lock focus, so that a loved one’s face illuminated only by candlelight is in sharp focus. Since photography is a form of expression that is essentially based on clipping a scene, framing is an important component of style. The E-620 provides four aspect ratios that serve as masks to frame your image to the desired proportions, including: the standard 4:3 aspect ratio that is perfectly suited for an 8 x 10-inch enlargement; the 16:9 aspect ratio that will display your images beautifully on a widescreen television; and other popular aspect ratios such as 3:2 and 6:6. By enabling you to select the aspect ratio before shooting and easily viewing it on the LCD throughout the shoot, the Multi-Aspect function offers a new way to control your photography and express yourself. The new camera’s Face Detection reduces the chance of blurred subjects in photography by distinguishing between people’s faces and the background. It tracks up to eight faces within the image area, even if people are moving, and automatically focuses and optimizes exposure for sharp, brilliant portrait pictures (ideal for large family or party group photos). 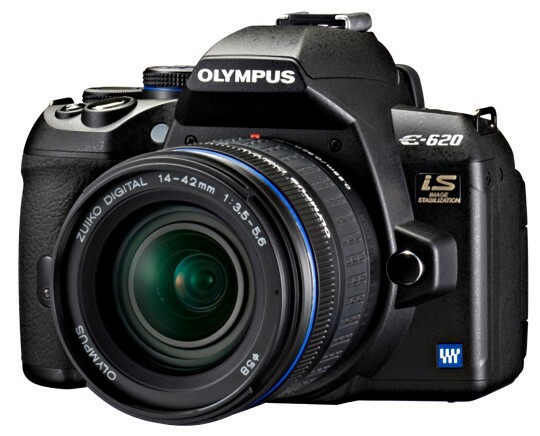 The Olympus E-620 DSLR will be available in May 2009. It includes E-620 Body, USB Cable, Video Cable, Li-Ion Battery Pack (BLS-1), Li-Ion Battery Charger (BCS-1), Shoulder Strap, OLYMPUS Master 2 Software CD-ROM, Manuals and Registration card.